My afternoon and evening at the Geological Society of America Annual Meeting was a mixture of activities. After grabbing a quick lunch at Subway (yes, students, you would recognize many of the restaurants here in Vancouver! ), I planned on starting to go through the Exhibit Hall, but I kept running in to people I know. This is always a “problem” (but a good problem!) at professional meetings, seeing old friends and colleagues that you haven’t seen since GSA last year. It is always great to stop and catch up with people, as networking is an important part of any conference. Rows and rows of geology programs! 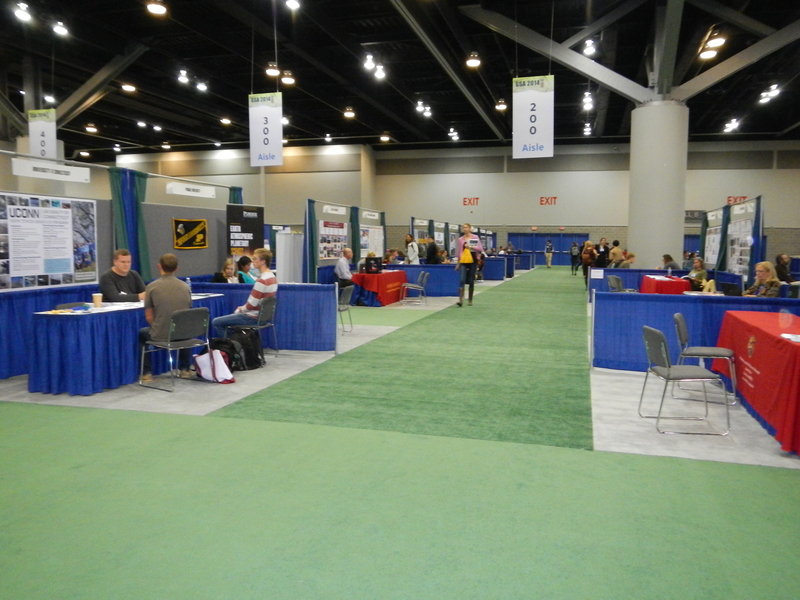 After chatting with several people, including my former dissertation adviser from the University of Miami – RSMAS, I glanced down the Campus Connection area in the convention center. In this section, there are approximately 50 geology departments with tables set up for students to sit down and chat with faculty and graduate students in their programs. Some students have interviews for graduate school right at this meeting! I wish I knew about this opportunity when I was an undergraduate student looking for graduate programs, as it would have been a great way to learn about so many programs at once and to meet the faculty. Of course, I encourage all students to go visit the actual campuses/departments of the programs they are interested in to learn even more. I then had to rush off to a meeting at one of the conference hotels. I’m on a faculty advisory panel for a new introductory geology textbook being written by two colleagues, Dr. Karen Kortz and Dr. Jessica Smay (see their NSF Award abstract). The publisher of the textbook hosted a working meeting and discussion relating to parts of the textbook as it is being pulled together. For example, what should be done with the abundant terminology that students will be introduced to? What should the review questions look like? Should there be information on geology careers? Students, rest assured, there is MUCH thought, review, and feedback that goes in to preparing a textbook for a course. Personally, I’m very much looking forward to this book, as it is written with best teaching/learning practices in mind, with accurate figures and an appropriate amount of content. David Gallo ended his talk with a quote from Marcel Proust: “The real voyage of discovery consists not in seeking new landscapes , but in having new eyes.” What a great way to think about ocean exploration! 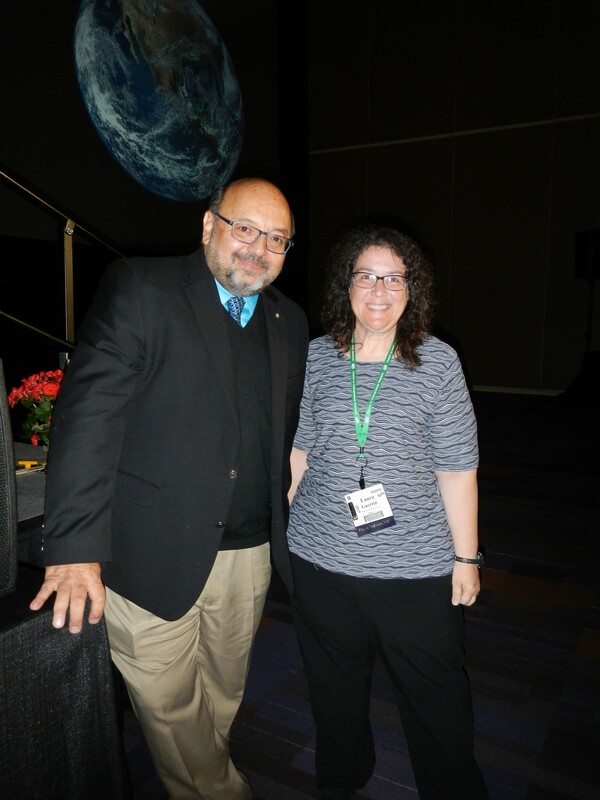 Overall, it was a great talk, and a great day at GSA! Back for more tomorrow!